Vancouver police's homicide unit is investigating after a fight at Hastings and Main streets in the Downtown Eastside resulted in the death of one man. 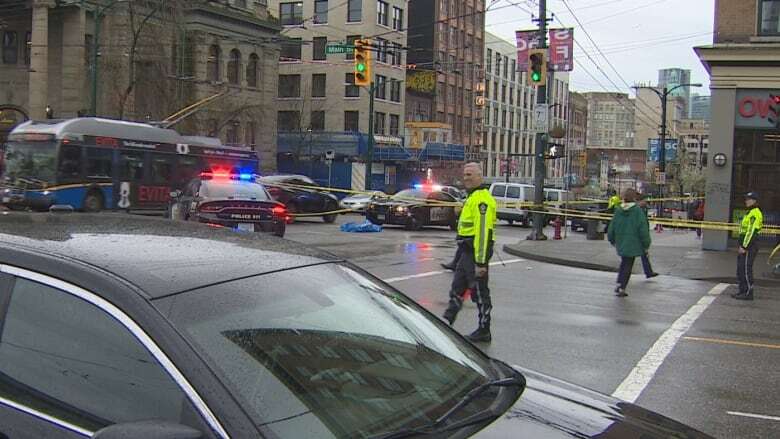 Vancouver police's homicide unit is investigating after a fight at the intersection of Hastings and Main streets in the Downtown Eastside resulted in the death of one man. In a release, police say officers witnessed at fight around 4:30 p.m. PT. A man has died after he was stabbed in a fight <a href="https://t.co/vMuCU9tZQR">https://t.co/vMuCU9tZQR</a> at Main &amp; Hastings around 4:30 this afternoon. "One man involved in the fight suffered a life-threatening stab wound," said police in a statement. "He was rushed to hospital by paramedics, where he died a short time later." Investigators have not made any arrests in the case but the Vancouver Police Homicide Unit is now involved in the case. Police also expect there to be traffic delays at the intersection for the next several hours.